As an original innovator of the portable alpha concept, PIMCO has been managing an increasing number of different portable alpha strategies for investors since 1986. And now, with Portable Alpha Theory and Practice, the PIMCO team shares their extensive experiences with you. Filled with in-depth insights and expert guidance, this reliable resource provides an informative look at portable alpha and key related concepts, as well as detailed discussion on the many ways it can be applied in real-world situations. Sabrina C. Callin, CFA, CPA, is an Executive Vice President and head of the StocksPLUS product management team responsible for PIMCO's global portable alpha–based equity business. 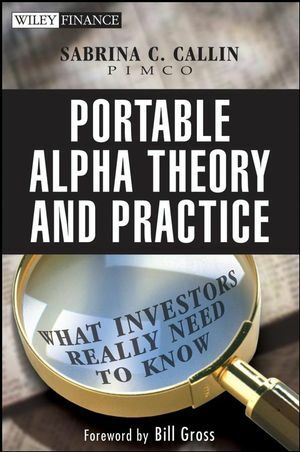 Ms. Callin is joined in authoring this book by a number of colleagues with deep expertise in key areas associated with the portable alpha investment application, and who have, on average, more than eighteen years of investment experience. PIMCO currently manages over $55 billion in integrated portable alpha strategies and is generally credited with being an original innovator of the concept. Chapter 1. Overview of Book and Key Concepts (By Sabrina Callin). Borrowing To Achieve Higher Returns. Leverage – The Good, the Bad, and the Ugly. The Confusion Surrounding Alpha and Beta. Portable Alpha Definitions and Trends. Back to the Basics: Investments 101. Asset Allocation and Related Concepts. Alpha, Beta, and Alpha-Beta Separation. Global Sources of (Portable) Alpha, Associated Risks, and Active Management. Derivatives-based “Beta” Management, Costs, and Risks. Elements of and Approaches to Portable Alpha Implementation. The Real Holy Grail: Risk Measurement and Management. Chapter 2. Portable Alpha Definitions and Trends (By Sabrina Callin). The Value of and Components to “Porting” Alpha. The Derivatives-Based Market Exposure (“Beta”). The Evolution of Portable Alpha. The Importance of Return – And Risk. Chapter 3. Back to the Basics: Investments 101 (By Alfred Murata and Sabrina Callin). Utility Functions and Risk Aversion. Portfolio Selection and the Efficient Frontier. Summary: It's All About Risk, Return, and Diversification. Appendix 3.2: Merger Arbitrage Example. Chapter 4. Asset Allocation and Portable Alpha (By Rob Arnott and Brent Harris). A World of Lower Returns. The “Classic” Model for Portfolio Construction. Challenges with the Classic Model. Risk Management: An Imprecise Science. Sustainable Spending in a Lower-Return World. The Constituent Parts of a Spending Policy. The Risk Premium and the Building Blocks of Return. The Role of “Alpha” in Setting Expectations. The Implications of a Slender Risk Premium. Dividends and a Slender Risk Premium. Benchmarking At the Portfolio Level. In Search of a Better Risk Measure. Chapter 5. Alpha, Beta, and Alpha-Beta Separation (By Sabrina Callin). Alpha and Beta in a Portfoli.o Evaluation Context. The Relevance of Alpha vs. Excess Return. Key Challenges of Alpha – Beta Separation and Estimation. Alpha Is Not Alpha Without Beta. Is the Alpha Actually Alpha? Beta + Beta + (+Beta…) + Alpha? Appendix 5.1: The Trouble with Alpha. Chapter 6. Global Sources of (Portable) Alpha, Associated Risks, and Active Management (By Sabrina Callin, Alfred Murata, Don Suskind, Steve Jones, Rich Clarida and Lisa Kim). Part Two: The Equity Markets and Associated Active Management. Part Three: The Fixed Income Markets and Associated Active Management. Part Four: Global Diversification and Currency as a Source of Alpha. Part Five: Hedge Funds as an Alpha Source. Summary: Evaluating Global Sources of “Portable” Alpha. Chapter 7. Derivatives Based “Beta” Management (By Jim Keller and Mihir Worah). Securities Lending as a Form of Low Risk Portable Alpha. Examples of Proactive Beta Management. Chapter 8. Portable Alpha Implementation (By Sabrina Callin). Liquidity for Margin or Collateral Calls. Consolidated Risk Management, Monitoring and Reporting. Comparing and Contrasting Different Approaches. Evaluating Portable Alpha Implementation Approaches. Appendix 8.1: Unbundled Portable Alpha Case Study. Chapter 9. The Real Holy Grail: Risk Measurement and Management (By Vineer Bhansali). Identifying Risks: Alpha, Beta and Leverage. Stress Testing: Measuring Risk in Portable Alpha. Chapter 10. Liability-Driven Investing (By Jim Moore). Case Study - Into Phase III. Beyond LDI – Incorporating Factors Outside the Pension Plan. Appendix 10.1: Building Better Betas through Financial Engineering. A Further Extension of the Portable Alpha Concept to LDI. Chapter 11. Portable Alpha Theory and Practice: Wrapping it Up (By Sabrina Callin). Ability to Borrow through Derivatives Market Set the Stage for Portable Alpha. Central Underpinnings to Modern Portfolio Theory Highly Relevant. Alpha and Beta – It’s the Combination that Matters. A Wide Variety of Alpha Sources Available. Key is Identification, Measurement and Diversification of Risk Factors. Important to Not Lose Sight of the Policy Portfolio. Prudent Derivatives-based Beta Management is Not Free. Portable Alpha Implementation can be Complex and Costly. Risk Management is a Critical Component of Success. Portable Alpha also Highly Relevant in an LDI Context. Portable Alpha Provides Tools for Better Investment ResultsNotes.